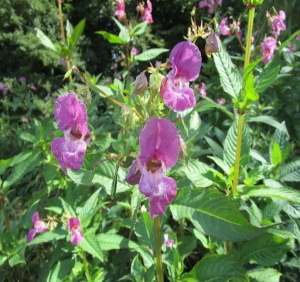 Himalayan Balsam (HB) is considered to be the tallest growing annual plant in the UK (2-3m) It is a non-native alien species introduced by the Victorians for its pretty pink bell-like flowers prompting its common name ‘Policemen’s Helmets’. It is attractive to pollinating insects who select it in preference to native flowers for its abundant supply of nectar. Without any natural enemies, HB can rapidly colonise vast swathes of riverbanks and countryside. HB plants grow vigorously, especially close to water courses, out-competing and smothering native species. They then die back over winter to leave riverbanks bare and susceptible to erosion. Dead plants can fall into the water, blocking channels and causing flooding. Small mammals, especially water voles, are vulnerable to predation through lack of native plant cover and reduced food sources. In common with most other UK rivers, the Otter, its estuary and tributaries have been invaded by HB. Since 2007 the Otter Valley Association (OVA) has attempted HB control measures, initially working on the main riverbanks. This approach proved futile as seed washed down-river simply produced new plants. In 2010 the OVA launched a new campaign at the same time as the Environment Agency (EA) who had also become involved. In 2005 a strategy of first clearing tributaries of the Otter was implemented on the River Tale and proved successful, so during 2012-14 the OVA adopted this same policy on the Lower Otter catchment. Austerity forced the EA to withdraw from Balsam control but since 2015 the OVA, Clinton Devon Estates (CDE) and other local groups have continued this work on tributaries down-river of Ottery St. Mary. Work parties are active during the spring and summer months. Whilst herbicides are effective, they cannot be used indiscriminately, particularly close to water courses. Pulling up the plant, including the whole root system (which is thankfully shallow) is the best method of control. Strimming can be used in open, areas without major obstacles, but return visits are required to discourage re-growth. Each HB plant can produce several hundred seeds. These are very effectively distributed by ‘exploding’ pods that showers them over several meters in all directions! It is very important not to leave any HB plants in a cleared area, especially the seed heads as these can be spread by water, animals, footwear and vehicles. Plants flower from mid-June to late summer. HB plants tend to proliferate in undisturbed patches of brambles, nettles and waterlogged areas. Take care if you go Balsam pulling and ideally go with someone else. If you are going to work in difficult environments with boggy ground and water-logged foliage, wear Wellington Boots, protective gloves, hat, eye protection and thick trousers. The most likely hazards are stings, scratches and skin rashes from nettles, brambles and corrosive saps from other plants such as Hogweed. Beware of cuts from barbed wire, sharp branches and broken glass and slips on uneven ground, slippery banks, tree branches and stumps.